I’m sitting on the dock on a warm day in May. 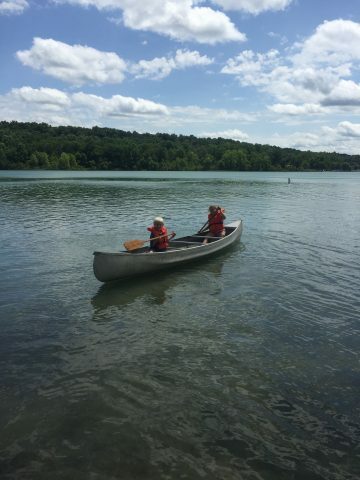 We’re in the midst of Outdoor Ed season, and canoes are out on the lake. Morning, with only a whisper of wind, the lake is glass and presents a perfectly inverted image of the opposite shore. Beyond shore the lake reflects sky, and the canoers float through clouds. I listen to the hollow clunks of paddle against boatside; a yellow warbler sings from the sumac; Canada geese then a couple mallards decide they’d rather not keep the canoes company and take off in a flurry of splashing, tenor-ish honks, and nasal quacks. My life, this place, this morning, this world – all feels like a gift. 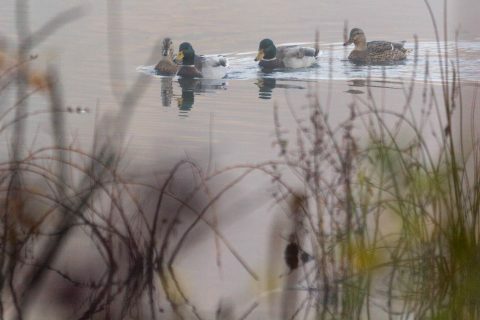 Mallard ducks are a common sight on Shavehead Lake. Something catches my eye near the dock, and I have to refocus to see beneath the water’s surface. The movement is slow, fluid, and gone before I have a chance to get a better look, so I’m left trying to make sense of what I thought I saw: a dark form maybe eight feet long, snaking along the lake’s bottom, leaving me with the goosebumped notion that some sort of primordial beast has swum up from Shavehead’s depths to experience the spring warmth. A breeze like a quiet exhalation moves across my skin and I come back to the 21st century, to the canoers, their percussion, blue sky, white clouds, and the rest of the present moment. Still mornings create excellent conditions for exploring Shavehead Lake by canoe. The water in Shavehead Lake comprises a minuscule fraction of Earth’s fresh water, and an even tinier fraction of Earth’s approximately 331 million cubic miles of total water (NASA Earth Observatory, 2018). Only about 0.007% of Earth’s water is stored in lakes, so you can imagine just how little Shavehead Lake adds to the blue of our blue planet (ibid.). Yet despite this seemingly negligible contribution to the big picture, Shavehead Lake is no less critical as a local natural resource. Countless organisms, including we humans, inhabit and otherwise depend on this proverbial drop in Earth’s oceans. 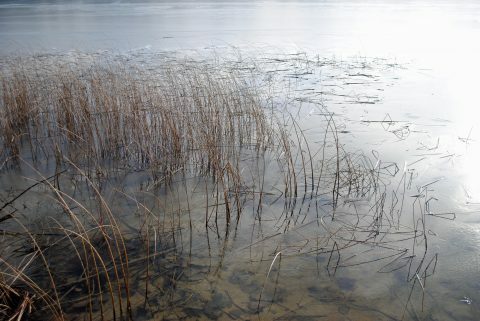 Furthermore, Shavehead Lake integrally connects us with all water on Earth through the water cycle, which continuously moves water throughout all regions, including below and above Earth’s surface. Through precipitation, evaporation, transpiration, infiltration, groundwater storage, springs and seepage, surface runoff, use by flora and fauna, ocean vents and currents, and even volcanoes, water traverses all realms (U.S. Geological Survey, 2017). Water carries and connects us. Still watching the canoes and listening, now, to delighted exclamations that travel across the lake as though through telephone wires, I anticipate reports of wildlife sightings: Canoers consistently mention turtles, snakes, and fish, thrilled by their encounters with creatures whose home is a whole different world. I think of my own Camp experiences, and the central role water played in shaping relationships: swimming the lake with my sister, going to the dunes, taking the swim test with cabinmates to earn a green tag. And memories involving winter’s water: the tube run, and cross-country skiing, awe-struck at the woods’ beauty. I think of my eldest niece, who attended her first summer camp and braved the daily polar bear plunge – and bonded so closely with friends that the end of camp brought a flood of tears – and of my youngest niece, who in May begged to go swimming even on days of rain in temperatures barely reaching 75 degrees. The sight of longnose gar from the dock can make you feel like you’ve taken a trip back in time to some prehistoric period. From the dock more movement beneath the water’s surface catches my eye, and the long shadow creature has returned. This time it lingers long enough for me to see it is not one creature, but several long, long-nosed fish swimming together as a unified whole. 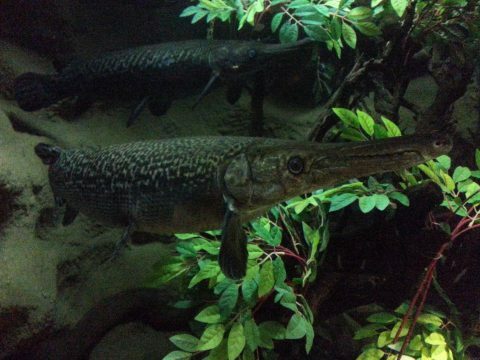 They are gar, which happen to be an especially primitive fish, gar fossils dating to the Cretaceous period between 145.5 and 65.5 million years ago (Fossil Treasures of Florida, 2018). How wild to think that, if Shavehead Lake formed after the recession of glaciers from this area 14,000 years ago (Schaetzl, 2018), these fish could be the 500th generation of gar; how wild to think that when we immerse ourselves in these waters we are surrounded by molecules that have seen time and place beyond our imagination! It’s time for the canoes to come in, so I blow my whistle. The morning is still practically perfect to be out on the lake, and lake still reflects sky. Students are chatty as they come in, and eager to keep exploring the water once out of their canoes. Why this draw, this magnetism? Water carries and connects us, yes, but water defines us: Water makes our world, and makes us – each made of water, dependent on water, we are all drops influencing Earth’s oceans. The East Fen is a promising area for spotting wildlife. Photo credit: J. Daniel Hess. Featured image credit: Gayle Gerber Koontz.